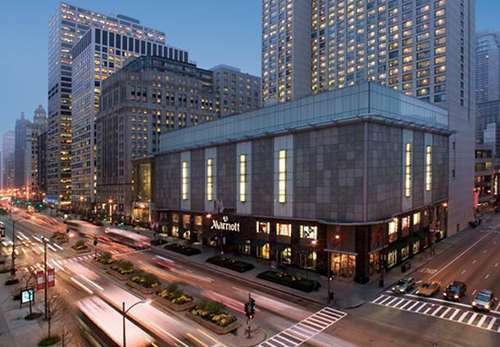 The Marriott Magnificent Mile is a renowned hotel on Chicago’s famed mag mile combining the epitome of luxury and convenience at the Marriott Downtown Chicago Magnificent Mile Hotel, a Windy City landmark on Michigan Avenue and situated amongst world-class shopping and dining. Not your average Michigan Avenue hotel. We’re your host to help you experience Chicago to its fullest. Magnificent shopping. Renowned dining. Chicago’s top attractions – Navy Pier, American Girl Place, Millennium Park, Theaters and Museums – all just a walk away. And when you are done exploring, we’ve got renovated luxury Chicago hotel rooms to relax and recharge. With 68,000 sq. ft. of versatile event space, we are a Chicago luxury hotel that provides a polished setting for productive business engagements, cherished social gatherings, and elegant wedding receptions. Discover the M.I. Greatroom, where business and pleasure come together in an expansive, comfortable, social space. Grab a bite at Rush Street Pantry, our new lobby marketplace concept featuring Chef-crafted food focusing on fast, fresh, gourmet options. Or, have it delivered directly to your room. At Chicago Marriott Downtown Magnificent Mile Hotel, we don’t want to just be your place to stay; we want to help you travel brilliantly. *Special price for guest room wireless Internet service for NATS Attendees is $1.00 per day. You can reserve online now at the special NATS Web Portal and receive your confirmation right away. To make room reservations by phone, please call toll free: 1-877-303-0104 and ask for the National Association of Teachers of Singing (NATS) Room Block. Deadline to make discounted room reservations: June 10, 2016. Marriott now only has limited space available and some nights in our room block are sold out. A personalized website for NATS Overflow Room Block-2016 (July 3, 2016 - July 14, 2016) has been created for you. Guests can access the site to learn more about the event and to book, modify or cancel a reservation from May 25, 2016 to July 19, 2016. You can also call 1-888-627-7039 and reference the NATS Block # NG03AA. Special NATS Group Room Rates: $149.00/night, single or double occupancy. Deadline to make discounted room reservations: June 10, 2016. The Gwen Hotel now only has limited space available and some nights in our room block are sold out. Click here to access the site: NATS Overflow Room Block-2016. OR Call 1-877-868-8232 and give group name of NATS. Deadline to make discounted room reservations: June 14, 2016. Click here to access the site: NATS Overflow Room Block - MileNorthHotel. Deadline to make discounted room reservations: June 17, 2016. Self-Parking: $27 per night with in and out privileges. Instructions for Attendees staying at the Chicago Marriott Downtown: Keep the white InterPark ticket that you received when you parked your vehicle. When you check-in to the hotel, notify the desk agent that you have parked a vehicle in the self-parking lot. Any time prior to you taking your vehicle out of the garage, please stop by the InterPark desk (located at the north-west corner of the hotel lobby) to get your self-parking ticket validated. At your time of departure, proceed to the parking garage and drive your vehicle to the gate. Insert the original white ticket into the gate reader and the gate will open. Should you have challenges, press the ASSISTANCE button on the gate reader and an InterPark staff member will assist you. Self-parking privileges expire at 4:00 PM on the day of departure. Instructions for Attendees not staying at our Conference Hotel: For those guests that will not be staying at the hotel; you will need to get you $27 discounted stickers. Those discounted stickers will be available at the 5th Floor registration desk in the hotel. When you obtain your sticker, you need to place the sticker in the empty space of the self-parking ticket. It is essentially a bar code that when they are ready to depart they insert into the machines in the lobby of the parking garage not at the hotel. That deducts the price down to $27. They will then insert the white ticket into the gate reader upon exiting and the gate will open. Special Online Pricing: Per Person Rate of $19 (3 or more people booked at same time) or $21 (1-2 people) for O'Hare and $15 per person for Midway! Fares do not include a $2 per person MPEA airport departure tax. Please follow the instructions on their web portal to make your airport transfer reservations. Visit the special reservation link to make your reservation for arrival in Chicago. From baggage claim, follow overhead signs to Rapid Transit Train. Take the Rapid Transit Train (Blue Line) to the Jackson Street stop. Go downstairs, through the tunnel toward State Street, then back up the stairs. Board the Northbound Howard Line (Red Line) and exit at Grand and State. Exit subway, walk two blocks east to hotel. From baggage claim, follow signs to Rapid Transit Train. Take the Rapid Transit Train (Orange Line) to the State and Lake stop. Walk down to street level, and enter the subway on State Street. Board the Northbound Howard Line (Red Line) and exit at Grand and State. Exit subway, walk two blocks east to hotel.